American Banker is reporting that the number of home foreclosures could soon “explode” as a moratorium that Fannie Mae and Freddie Mac put on foreclosure sales and evictions in late November is scheduled to expire. Known as Fannie Mae, the Federal National Mortgage Association was founded in 1938 during the Great Depression. It’s purposewas toallow lenders to reinvest their assets into more lending and in effect increasing the number of lenders in the mortgage market. The Federal Home Loan Mortgage Corporation, known as Freddie Mac,was created in 1970 to expand the secondary market for mortgages. 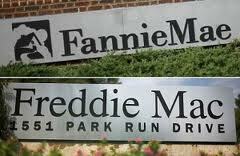 Freddie Mac buys mortgages on the secondary market, pools them, and sells them asmortgage backed securities. At the time of the November 2008 moratorium Freddie Mac had somewhere between 5,000 to 6,000 loans scheduled for foreclosure, and Fannie Mae reported having more than 10,000 loans heading for foreclosure. American Banker does point out that this forecast ofa major increase in foreclosuresassumes no government intervention such as the current efforts tolet bankruptcy judges rewrite mortgage terms to help people keep their homes. A Chapter 13 bankruptcy can often allow you to pay the arrearages on a home loan and stop a foreclosure if you have the income to resume monthly payments on the mortgage and pay the arrearages through a Chapter 13 Plan. If you cannot afford the payments on the mortgage or cannot pay the arrearages, a Chapter 7 bankruptcy can prevent you from being personally responsible for any deficiency amount that could be due after a house is sold at a foreclosure sale.